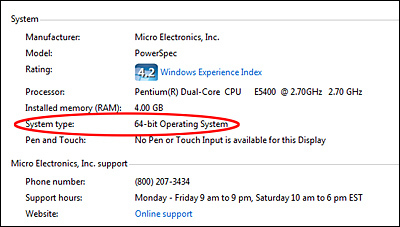 Micro Center Tech Support: 32 or 64-bit? A common question that we get here at Tech Support is: how can I tell if my computer is 32 or 64-bit? To find out what type of system that you have is easy. Go to My Computer on your Desktop. Right-click on the icon and select Properties. Under the System component list, look for the System type. The menu should state whether your computer is 32-bit or 64-bit Operating System. An alternate way to get to this menu is to go to Control Panel -> System. The information that is listed is the same.